Hoo-rahh! Yesterday I completed the Tough Mudder UK North West event, held at Cholmondeley estate. I was part of an awesome team and it was nothing short of a spectacular morning out. On the drive in I was a bit anxious of what to expect, but once we arrived I resigned myself to accepting whatever the course organisers threw at us. Looking beyond the manufactured excitement of Death Waivers and barbarically named “Electroshock” obstacles, the course was an undulating 12 miles with just over 20 obstacles ranging from jumping into ice bathes, and clambering over mud obstacles to carrying wooden logs and climbing across monkey bars above a pool of water. Most were well thought out and engaging, a couple were mundane, and one could have been made safer (one of my team mates fell off it onto a wooden frame and broke 2 ribs). Our team was full of enthusiasm throughout the course, shouting out clichéd motivational slogans, military phrases, and motivational movie quotes for good measure (insert Gladiator Maximus revenge quote here), and a couple of us had also had a pre-race beer to loosen things up. We adopted an efficient running style through the running sections, not losing pace when the mud got deep and covering ground fast when it was flat and grassy. The organisers had appeared to have sprayed additional mud onto the course, but the clue was in the name of the event so I expected no less. In one obstacle I voluntarily dive-bombed into a pool of mud, spraying a few other competitors… some lacked a sense of humour! The obstacles that were designed to be confined or underwater were manageable – the quicker we crawled through or swam under them, the sooner we were out the other side. I was surprised how little upper body strength was required on the course, though core stability was useful as the course was designed to keep you clambering in all directions. Confusion as Mudders psyche themselves up to bob underwater. The water was so cold everyone in my team got brainfreeze. Everyone in my team wore trail or fell running shoes, which worked a treat in muddy and grassy conditions. We all wore quick-drying technical clothes, mostly close-fitting. Moving fast after water obstacles dried our clothes and kept us warm. I suffered a minor wardrobe malfunction when a team mate hoisted me up a high wall by my shorts, ripping a 2 inch hole down the rear seam. I was the source of much amusement for my team for the rest of the course! Throughout the course there was great camaraderie within teams and between strangers, especially when overcoming the high “Berlin walls” that really required teamwork, and the “Everest” challenge near the end of the course – a large greased up half pipe. I was a lucky one who managed to run, jump and grab the top, but the top was lined with participants helping out their fellow Mudders. The final obstacle, the much feared “Electroshock”, was a gauntlet of dangling electrified wires. They packed a punch – genuinely, it was like being punched every time they hit me, which was three or four times! After the race we received the race goodies – a technical t-shirt, Tough Mudder orange headband and a beer. I was still so pumped up I took an hour or so after the course to stop whooping and hollering. Having had a year of relatively hard events, this one was a great penultimate event with favourable weather, made all the more memorable because I ran it with a great team. Hey you made the papers… page 9 of the Metro! Someone’s having an Arctic Enema! It wasn’t as bad as it sounds! The obstacle in the photograph in my blog post was much colder because we were in the lake for longer. Also, getting repeatedly zapped by Electroshock was like being punched in the back… repeatedly! I wonder whether you stumbled across this blog whilst contemplating doing the next Tough Mudder in the North West? 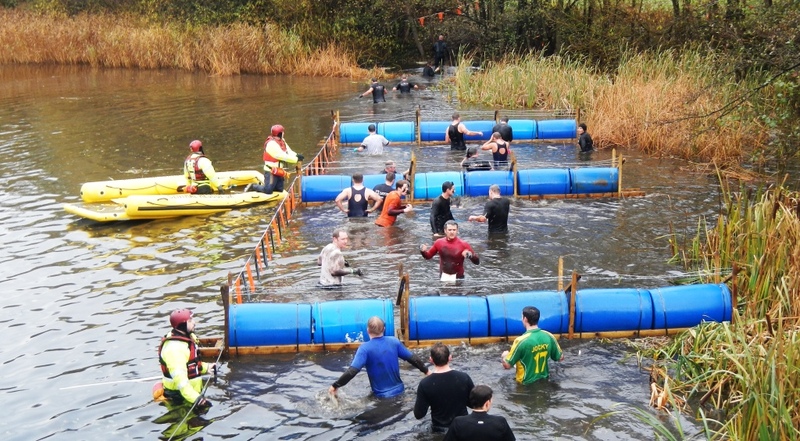 I’m signed up with a team for Born Survivor in the Lake District in a fortnight (Sept ’13) – lots of obstacles over 10k. Fingers crossed no electrified obstacles! ← The 30th Athens Classic Marathon – Race Day!